Before I moved to Italy, I had only heard of polenta, I had never actually tried it. It’s not something my in laws ever make, so I didn’t actually get around to eating it until I had been here for well over a year and I decided to make it myself. I was still eating dairy back then and followed a simple recipe that called for stirring some feta cheese and dill into the polenta near the end of its cooking time. It was utterly delicious. Even hubby who is not a polenta fan loved it. But then again, I think the feta had something to do with that. Polenta is a classic Northern Italian dish, originally a peasant food, made of cornmeal or historically millet, barley or buckwheat, before Christopher Columbus brought corn back from America. It’s cooked into a porridge and served immediately or spread into a casserole dish, allowed to set and firm up and then sliced and baked, fried or grilled. It’s usually served with a sauce made of meat, mushrooms or a variety of vegetables depending on the region. Sometimes cheese is cooked into the porridge. It is usually associated with being rich and heavy and decadent and most certainly not considered a breakfast food by the average Italian as I’m proposing it here. But I’ve discovered that it makes a tasty breakfast porridge indeed, especially when topped with stewed fruits. 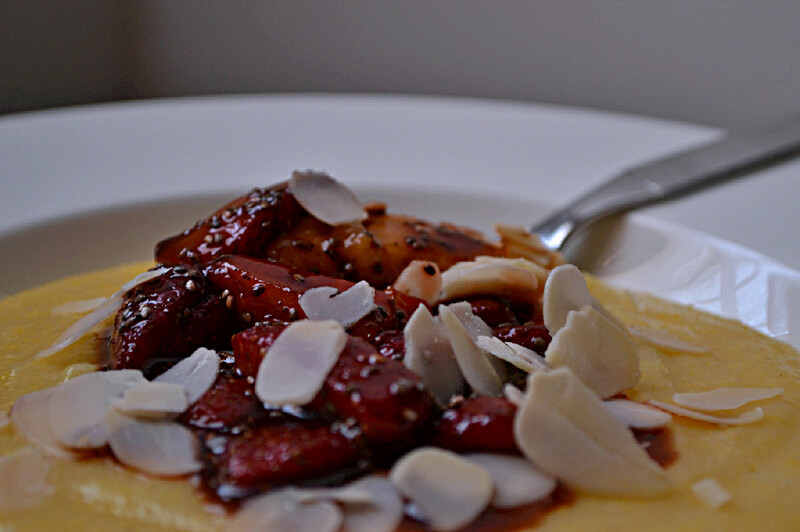 Polenta today is mostly made from corn meal which is made by grinding corn kernels down into a coarse powder. It is naturally gluten free and perfect for those with Celiac disease or gluten intolerance. However, as most of the corn in North America is genetically modified, it’s best to look for non GMO organic cornmeal. Luckily Europe and Italy have outlawed GMO foods for human consumption, and while the cornmeal we find here does not have the risk of being genetically modified, I buy organic anyways as a personal preference in general. Whole grain cornmeal is a great source of protein and dietary fiber, as well as B complex vitamins and iron, magnesium, phosphorous, manganese and selenium. It makes a great addition to baked goods, either in a coarse or fine grind and makes a wonderful sweet or savoury porridge. *quantities given for 1 serving, can be multiplied to serve more. Bring water to a boil and pour cornmeal into the boiling water, slowly in a water fall motion. Stir vigorously with a whisk to prevent clumps. Reduce heat to low and cook for 20 minutes, stirring every minute or so to prevent clumping and sticking, until a thick and creamy porridge forms. You may need to add a bit more water as you go along. 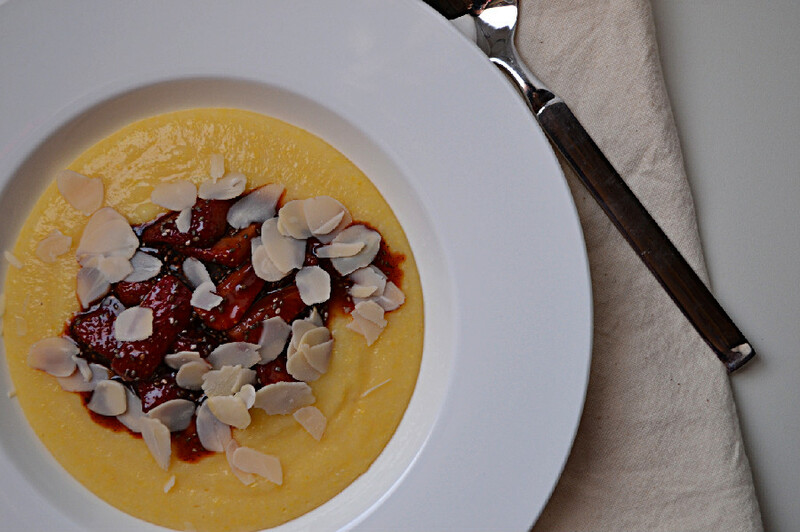 While the polenta is cooking, add the strawberries, balsamic vinegar, filtered water, brown rice syrup and vanilla to a small pot or pan and stew on low heat until lightly caramelized, about 7 -10 minutes. Let the strawberries cool slightly, then stir in chia seeds. Once the polenta us ready, turn off heat and stir in oat milk, whisk vigorously to prevent clumps. 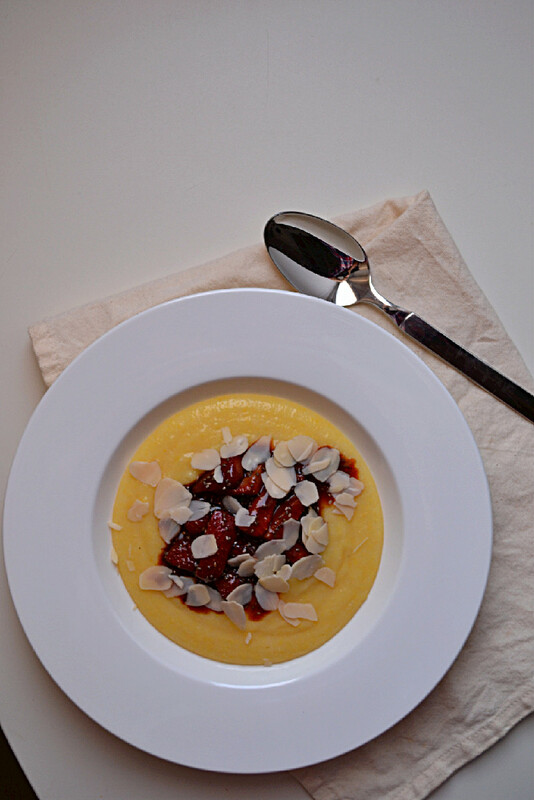 Poor polenta into a shallow bowl, top with stewed strawberries and flaked almonds. Serve immediately.